Access to medical care is not always possible. In the United States alone, some remote areas are over 30 miles away from the nearest hospital. However, this doesn’t just apply to remote areas of the world. We’re also talking about places that have recently experienced natural disasters. Fortunately, there’s a better way than erecting a temporary hospital or funding a permanent hospital to get these people the medical attention they deserve. Introducing mobile medical clinics. Mobile clinics can be anything, from a parked trailer to container hospitals that are shipping containers. Many of these mobile medical clinics are unique to the needs of a specific health service, such as emergency medicine, primary care or dental care. They make it possible for doctors, dentists and other medical experts to bring their services to places in need. If you’re looking to build a mobile medical clinic for your practice or your organization, you’ve come to the right place! 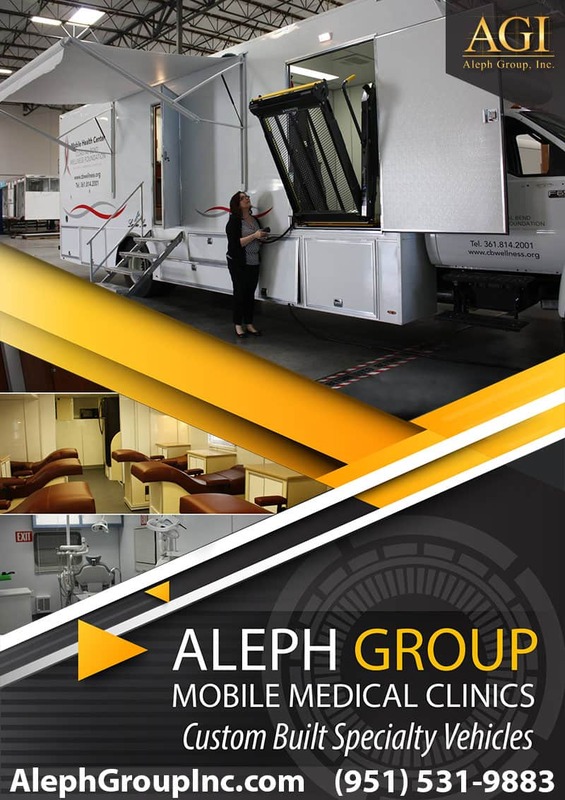 Here at Aleph Group we are dedicated to helping you create your custom medical vehicle so you can better serve your patients and your community. If you are not sure where to start, just give us a call and we can help you with any questions you might have about the process. Right outside your dentistry, people are constantly battling dental pains. Many aren’t able to get to a dentist in a timely fashion, making it harder and harder for them to take care of their dental health. You’re number one goal as a dentist is to bring dental care to those who need it, and fortunately everyone needs dental care. Let’s take a look at why a mobile dental clinic is perfect to add to your practice.